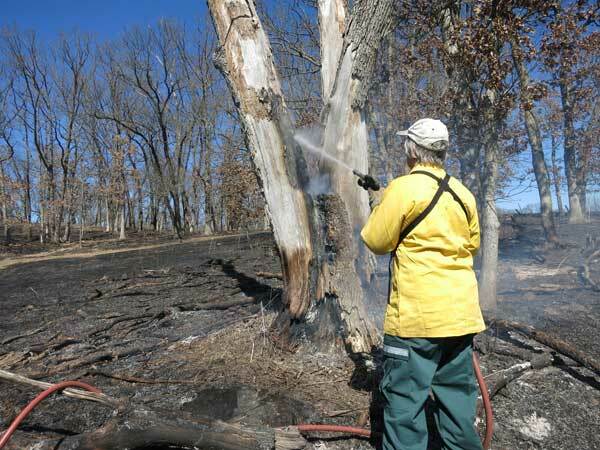 Given the right fuel and weather, oak savanna burns can be as complete as prairie burns. However, there are times when unburned patches remain after burning is otherwise complete. Although these unburned patches could be "touched off", the drip torch operator(s) have often moved on and don't have time to go back. 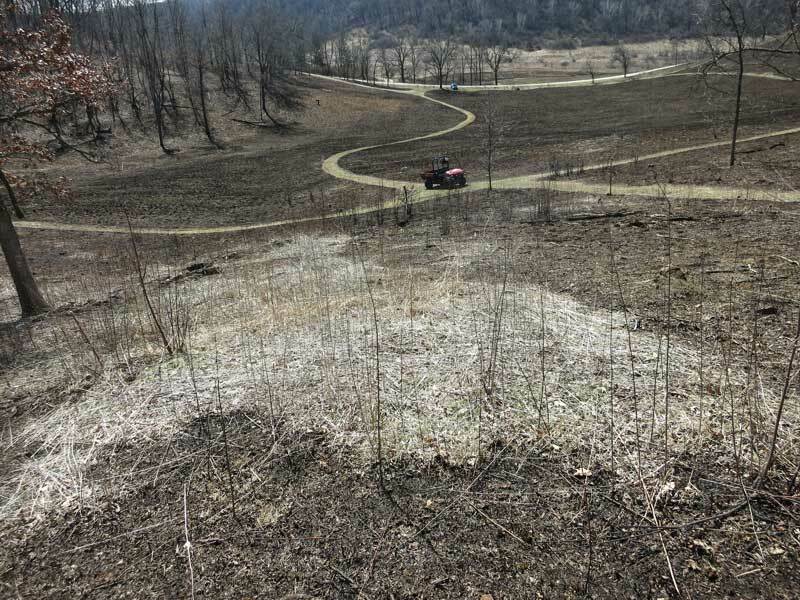 The oak savanna burn at Pleasant Valley Conservancy on March 21, 2017 was mostly successful, but distinct unburned patches were left in the white oak savannas on the lower slopes (Units 11D and 12A). Yesterday I had time to go back and try to figure out why these areas did not burn. 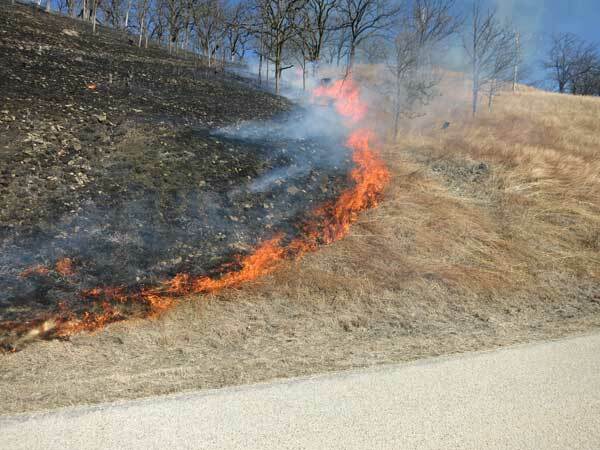 There is plenty of fuel in this patch (oak leaves and prairie grass), and if "touched off" it should burn completely. Since this unit faces south and has substantial steepness, it was backburned from the top of the hill to protect the large open-grown white oaks (over 150-years old). Because the wind was variable, it might have been blowing uphill at the time the fire line reached this point. Also, this patch is almost level, which could have influenced the fire line. Although the fire went out here, it burned around the edges and continued downhill. This patch constitutes what is called a "refuge", where fire-sensitive organisms survive. My estimate is that about 85% of Unit 12A burned completely, leaving about 15% as refugia. In the adjacent Unit 11D the unburned areas were even more, amounting to about 50%. The year 2017 was without a doubt the most successful burn year that we have had at Pleasant Valley Conservancy. 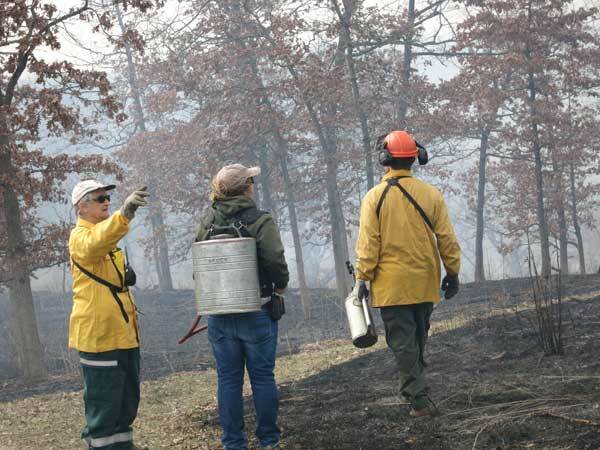 If we include the North Woods burn that was done in November 2016 (part of the same dormant season), we burned 132 acres: 34 acres (November) + 98 acres (February/March). Also: For the first time we were able to burn virtually all of the PVC-owned wetland (15 acres). The GIS-based map shown here provides the details. Several factors contributed to the success of the burns. 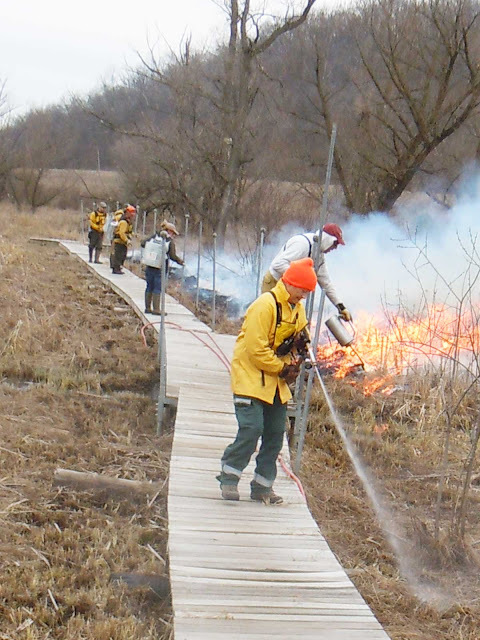 The simplification of the DNR permitting system made it possible for us to make our plans the day before a burn. The NOAA weather predictions have been detailed and accurate. The graphical version especially provides hour-by-hour predictions of the four key weather elements we use: temperature; dew point; relative humidity; and wind (speed and direction). The availability of a very capable burn crew from Integrated Restorations, plus experienced supplementary people; all available at the ready when conditions are right. Our own experience. We have been doing these burns for 20 years and have learned how to do them. Among other things, we are doing larger burns, getting as much fire on the ground as possible when the weather permits. Amanda's great work as burn boss, supervising the crew, getting all burn breaks ready ahead of time and ensuring that we have enough water and drip torch fuel. 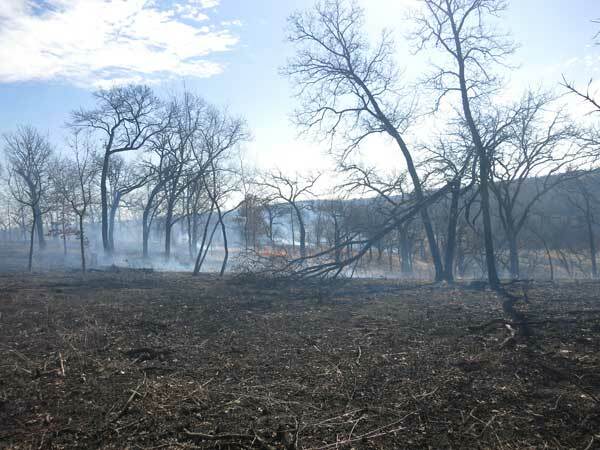 The success of our restoration efforts, which has meant that the vegetation of the burn units is "fire-ready". Although some internal lighting is still necessary, once the black line has been burned in, most units burn themselves with very little work on our part. 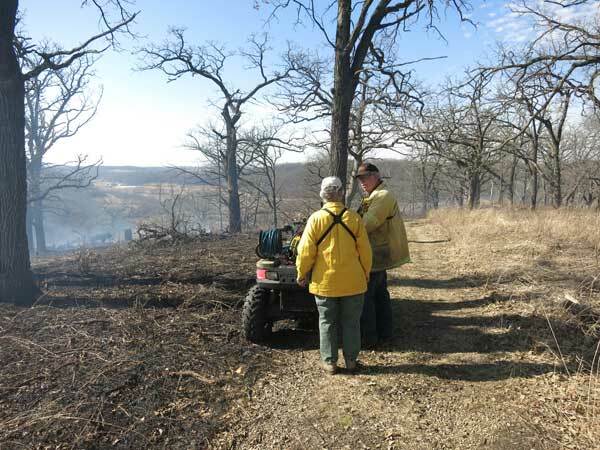 Kathie and Denny monitoring the edge of the savanna burn; Feb 2017. Later stage of the savanna burn; Feb 2017. The fire line carried all the way through the unit. Protecting the boardwalk while burning the wetland; burn of March 23, 2017. The Kawasaki Mule with pumper unit was backed up to the edge of the boardwalk. 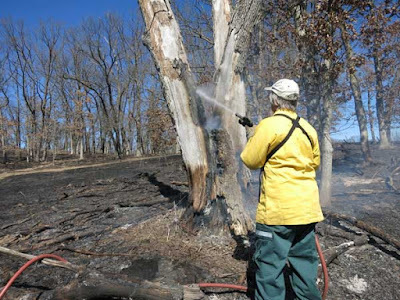 What to do with dead trees during oak savanna burns? Scattered dead trees are characteristic of oak savannas. Some of these trees are fire-sensitive species such as birch and cherry, whereas others are oaks that die as part of the standard mortality process that occurs in forests. Standing dead trees, often called “snags”, are an important part of the savanna ecosystem and are left for wildlife. Dozens of animal species depend on snags, including numerous cavity-nesting birds, some mammals, and a vast array of insects and other invertebrates. In addition to snags, logs and other woody debris that fall to the ground, generally called “coarse woody debris”, play additional important roles in the savanna system. However, the dead wood in a savanna becomes a special problem during savanna burns. 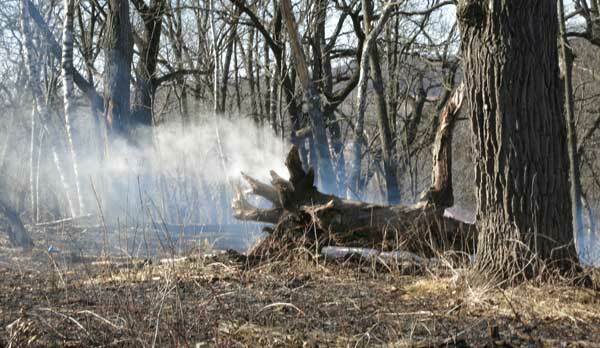 As part of the rotting process, dead wood becomes fire sensitive, and can cause problems during the burn mop-up process. Dead wood is subject to decay by wood-rotting fungi, which break down the lignin and cellulose that confer rigidity on the tree. Decay results in formation of wood that is soft and spongy, generally called “punky”. Punky wood catches on fire unusually well. (Another name for punky wood is “tinder”.) A few sparks from a strike by flint and steel is often all that is needed to start a small fire. The radiant heat of a fire passing near a tree with punky wood may all it takes to start a small fire. Although these fires generally go out quickly, there is always the possibility of a larger scale conflagration. Why is punky wood more flammable than intact wood? In intact wood, heat is conducted into the interior and dissipated. Punky wood has an open structure surrounded by air, so heat is retained, and the oxygen necessary for ignition encourages the flame. Everyone knows that if you want to start a fire in the woods to cook your dinner or stay warm, you first find some tinder (punky wood) and use it at the base of the campfire. According to U.S. Forest Service data, punky wood will ignite and create a flame at a lower temperature than grass (~230 C instead of > 300 C). At Pleasant Valley Conservancy we work hard to protect snags from fire by clearing a fuel-free zone around the base of each snag. This generally works well, but occasionally we get fire in a snag and have to put it out. The photo here shows how we deal with this. A dead white oak in the East Basin savanna. Although it had been cleared around (see base of tree), some of the punky wood still caught fire. Kathie is using the high-pressure water from the pumper unit in the Kawasaki Mule. It took only a few minutes to put out the fire. If a snag smoker is well within the burn unit we generally leave it, as the fire usually goes out, and getting rid of the punky wood is actually beneficial. However, the tree shown in this photo is fairly near the edge of the burn unit, and there is about 40 acres of grassland nearby that belongs to someone else. Given those conditions, we put the fire out. The photo below shows a large fallen log that fell, next to a live bur oak. We did not bother to put this fire out, because the tree is well inside the burn unit so that there is no danger of a spot fire. Letting logs like this burn helps recycle nutrients into the ecosystem. This log is a good example of large coarse woody debris. It is in Unit 19D, well inside the burn unit. The original Wisconsin highways were cut through vast acreages of remnant prairies. Of course, once a highway is created, development follows. The information below came from the Wisconsin DOT web site, which can be reached at this link. I reformatted the table to make it more legible. Deer Lake Rd./Bear Lake Rd. 0.4 mile W of Kahl Rd. 1.2 miles E of 6th Ave. I don't guarantee that all of these remnants still exist, although even without restoration work or burns a few more vigorous prairie species may still be present. I have only been to a few of them. I have been watching the remnant west of Cross Plains for many years, where prairie dock and a few other species have been able to hold their own among onslaughts of wild parsnip and spotted knapweed. Note that the data are only from Wisconsin or U.S. "numbered" highways. There are lots more remnants on county and town roads. If you visit any of these sites, park carefully and keep an eye out for traffic! 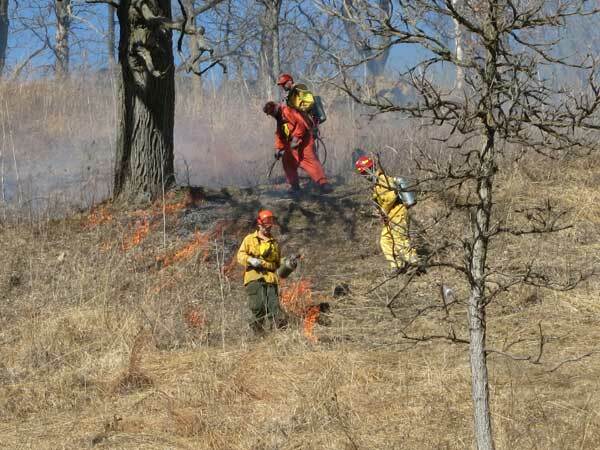 Early March is generally a good time to control brush on a prairie. 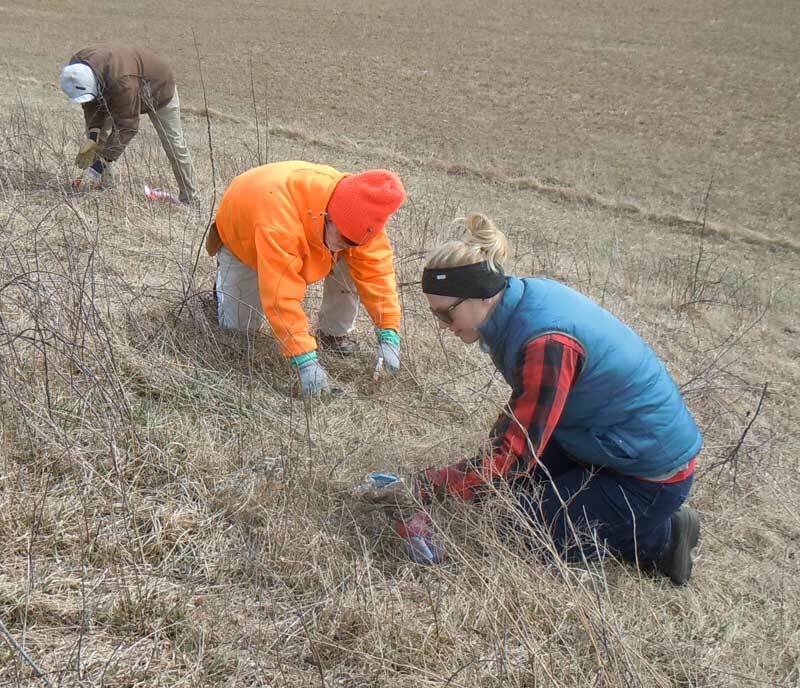 The snow is generally gone, and the prairie has not been burned yet, so the stems of the woody plants are alive and will translocate herbicide to the roots. Yesterday (March 12, 2017) was especially good because Daylight Savings Time had started, so the afternoon was long. Black Earth Rettenmund Prairie State Natural Area is a high quality prairie remnant that has been intensively managed for over 30 years, first by the Nature Conservancy (TNC) and now by the Prairie Enthusiasts (TPE). 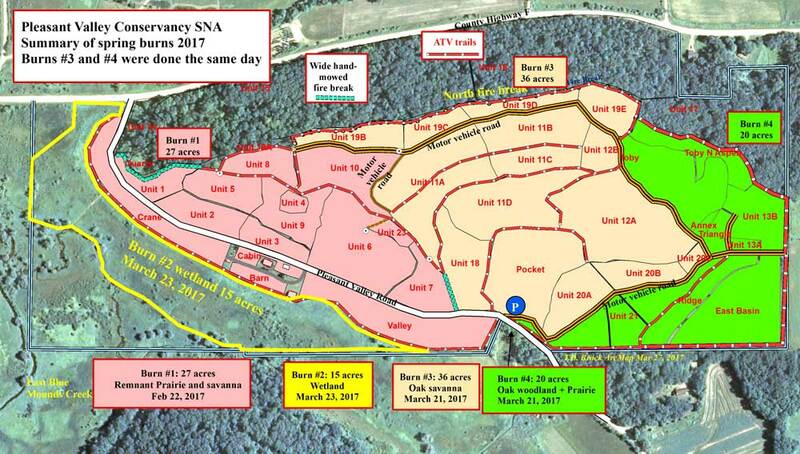 However, despite its high quality, it still suffers from the legacy of woody encroachment that had occurred before TNC acquired it. Particular problem plants have been honeysuckle, sumac, gray dogwood, and bittersweet. Woody plant control with the small brush that we deal with at BE involves a lot of stoop labor. Each stem is hand-cut (clippers) and immediately treated with 20% Garlon 4 in bark oil. A red dye is added to the herbicide in order to keep track of treated stems. Because the small stems are hard to find once cut, it is essential that the same person who cuts the stem treats immediately with herbicide. Thus, this is a two-fisted job. A three-hour volunteer work party with a 15-minute break in the middle is ideal. You can get a lot of brush killed in 3 hours and it isn't long enough to get bored.